We've started potty "training" Aaron. I say "training" because he already knows how to do it--we just sit him on the potty and he does his thing. He really seems to like it; he sits there and unrolls the toilet paper (or he did until we moved it...), looks at himself in the mirror, talks to me, blows raspberries, and whatever else suits his fancy. He seems to understand what it's for too. He will usually wait to go until I put him on the potty, unless it's been too long. We certainly don't catch everything, but there have been far fewer poopy and wet diapers to change lately, which is awesome. I figured he probably won't be totally potty trained for a while, but at least he will be used to the toilet and understand what it's for. Yeah, it's still cold here, but that day it was a little warmer and I just couldn't resist seeing those little chubber legs and feet (I changed him into long pants and socks just after taking this). We finally enjoyed another night of sleep. It's amazing how much better everyone feels and acts. Lately, Aaron hasn't been sleeping very well. 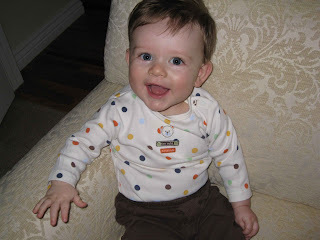 For more than a few nights, he woke up whining or crying every hour or two all night. Last night he slept for about 9 hours straight, which is almost unheard of for him. He didn't eat so much yesterday so I fed him earlier than normal today at about 5:15 am. After eating and a diaper change, he went back to sleep until 7:45am. All said, he got about 12 hours of sleep last night. I don't remember the last time he got 12 hours of sleep with only waking up twice. I'm not sure if our new-ish schedule or sleep routine are starting to work, if he was finally so exhausted from his crazy sleeping that he just shutdown for 12 hours, or if it was a lucky fluke night. In any case, it was a good start to the week. 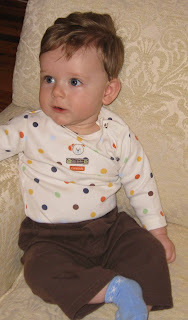 Here are some pictures of our well rested 6.75 month old boy-- baby.